The fates, Mother Nature, and atmospheric rivers blessed Lake Tahoe this winter, and as the mountain season eases into spring it provides some uniquely Tahoe opportunities. Not sure what to do on your vacation? How about skiing, golfing, and paddle boarding all in the same day? With area resorts staying open almost through April, Heavenly’s closing date is set for April 30, Sierra-at-Tahoe, April 23, and Kirkwood April 16; there is snow to be skied and celebrations to join. Heavenly’s Spring Loaded runs through April 8 and includes live entertainment, pond skimming, the Gunbarrel 25 race, and outdoor concerts. Sierra-at-Tahoe has several slopestyle events still to come in April and they’re closing down the place with a Salsa Showdown on April 22. The water is cold, but it’s not unusual to see paddle boarders out on the lake in April. The glass-like surface is just too beautiful to resist and with the temps rising to an average of 55 degrees during the day it feels pretty good. Just remember to wear your life vest in case you take a dip. 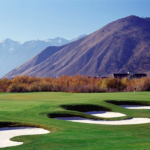 Golf courses at the lake usually open in May, but a short half-hour drive down the mountain to the Carson Valley offers several options including Genoa Lakes, with two courses to chose from – the Lakes Course or Resort Course. The Lakes Course, designed by PGA Champion Peter Jacobsen and John Harbottle III, meets head-on with the eastern slopes of the Sierra Nevada as it weaves through lush wetlands and the winding Carson River. The Resort Course designed by Johnny Miller and Harbottle offers wide open spaces and high desert views with over 300 feet of elevation changes. Lake Tahoe Resort Hotel can help you with tee times by clicking on “Build Your Own Golf Adventure” on the specials page. 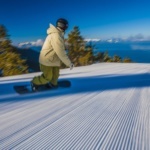 Lake Tahoe Resort Hotel is your base for a spring break that’s going to be truly awesome this year. Check out the resort’s Snow Special with rooms from $89 a night through April 30. Suites at this great rate have limited availability so book now. Use offer code SKI17.